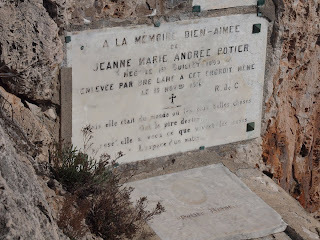 Jeanne Marie Andrée Poitier was born in 1899 and was the gardener's daughter at the Villa Cypris. When she was 17 she was made pregnant by Olympe Hériot, the owner of the house. Unable to bear the shame she threw herself off the rocks and drowned. This is her tomb. So many people must walk the Promenade le Corbusier and don't know this sad story. Thank you so much to Gerard and Ulla... even though I did have sore legs the next day! Jeanne Marie Andrée Poitier était née en 1899 et c' était la fille du jardinier de la Villa Cypris. Quand elle avait 17 ans, elle fut mise enceinte par Olympe Hériot, le propriétaire de la maison. Incapable de supporter la honte, elle se jeta sur les rochers et se noya. Il s'agit de sa tombe. Tant de gens doivent marcher sur la Promenade Le Corbusier sans connaitre cette triste histoire. Merci beaucoup à Gérard et Ulla ... même si j'ai eu mal aux jambes le lendemain! (In this photo you can see the tomb in the rocks - in relation to the building we saw yesterday). Jilly, i've been many times near this place and I NEVER knew about this story! It's so sad!a big thank you to you and to your friends to let us know about this poor jeanne..Next time I go there, i'll try to see that tomb. PS: a gift for you on my blog today! Fantastic series of photos on this walk, Jilly. I want to walk it. This is such a sad story; thank you so much for those amazing photos. Jilly, it is written that she was killed by a rogue wave. Was she or did she commit suicide? that is a sad story, but a beautiful tomb & memorial nonetheless. What a poignant spot on your beautiful tour! I guess it is proof that ugliness can lurk anywhere. I am glad Jeanne is at rest in a beautiful place, and that intrepid photographers like you preserve her story. I literally gasped when I read that information. I am going to make my way along the walk to find it this summer. Your pictures give a good perspective of it too that will help in getting to it. What a story! Thank you. Nadege, yes the truth is she committed suicide. Thanks everyone for the comments. I too found this story so sad, so surprising as I had no idea this tomb was here. It's impossible to see (apart from a square of concrete) from the path itself. The things you do to serve your blogging public! Wow. What a story... Her hidden tomb makes me think of the sorrow felt by those who created it. Very good post. Jilly, it is amazing that you can be in a place for many years and not know the hidden places and stories such as this. Thank you for risking life and limb to take the photos and for sharing this story. The last shot is fantastic and puts the hazard in perspective! Merci de nous faire découvrir cette tombe et cette tragique histoire que j'ignorais totalement ! j'y penserai la prochaine fois que je ferai la promenade. 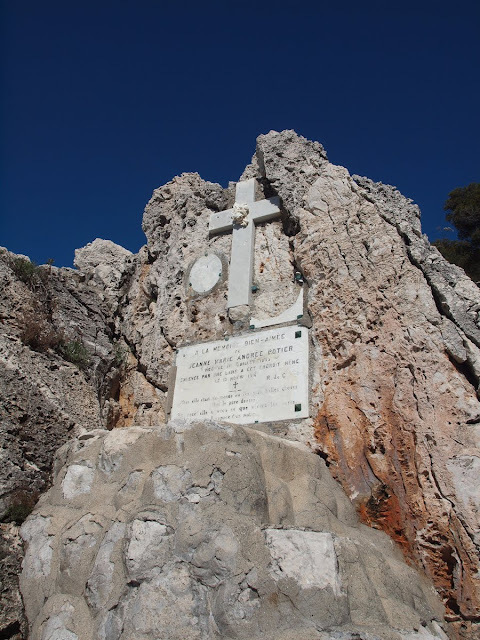 I will be in the Cote d'Azur next week and during my time there I will be going by E.1027 again at some point and thought I would go further on the path to look for the tomb to try and photograph as well. Does it stand out a bit from the path? Is it easy enough to find? 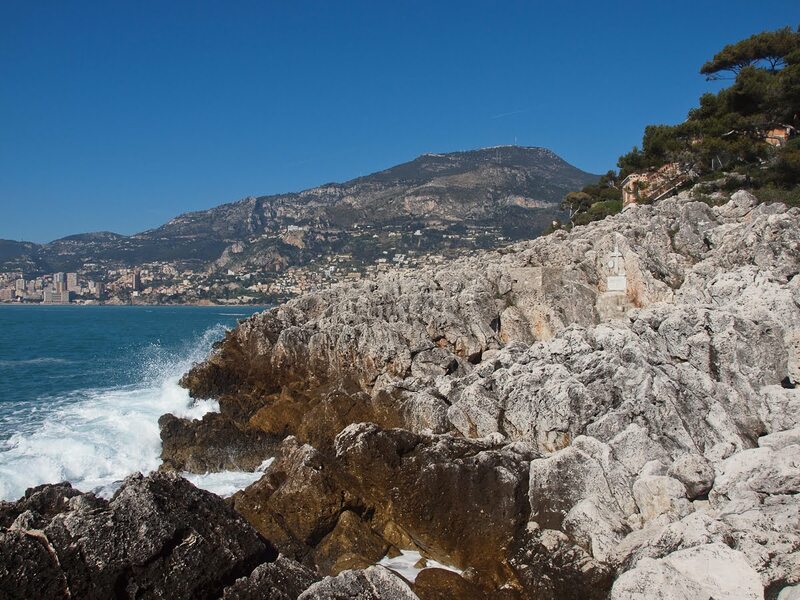 You will see the rocks that stretch out into the sea - the tomb is in the middle of those. So walk past this building (under the walkway) and beyond there is a gate that leads down to these rocks. At this point, in the distance you should be able to detect what looks like a slab of concrete (this is the back of the tomb). You will need to clamber over the rocks to see the tomb from the front, and it's tricky. Those rocks are very pointy and you have to walk on the points. Take care especially with cameras around your neck. If you look at the third photo in the post about the tomb you can see the Villa Cypris building in the background which should give you an indication as to the tomb's position. Thanks for the quick response and the detailed directions. I'll give it my best shot and I'm sure either way I will enjoy the walk.